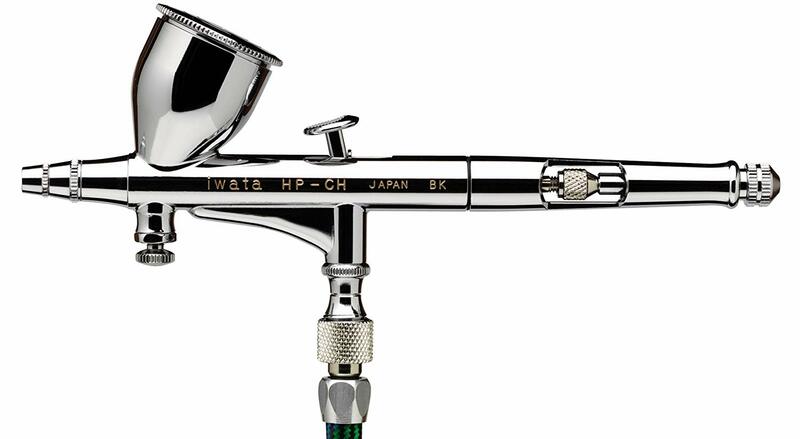 Our Iwata HP-CH Airbrush is for advanced artists. This airbrush provides complete control of the airbrush pattern, from a hairline to 3/4 inch (20 mm) round. It is ideal for extremely detailed work. The Micro Air Control valve allows the artist to use very low pressure which is especially helpful when applying makeup to children or around the eyes. FREE GROUND SHIPPING (Continental US). Fulfilled by Graftobian. Our low pressure Iwata Eclipse Hi-Line HP-CH airbrush is for artists who need extreme control of detailed spraying. This airbrush provides complete control of the airbrush pattern, from a hairline to 3/4 inch (20 mm) round. The Micro Air Control valve enables incremental control of airflow for fine to large spray patterns. Great when applying makeup to children or around the eyes. Eclipse HP-CS Dual 1/3 oz Gravity fed HD makeup, plastic models, dioramas, signs, t-shirts, auto art, props, general purpose MOST POPULAR !